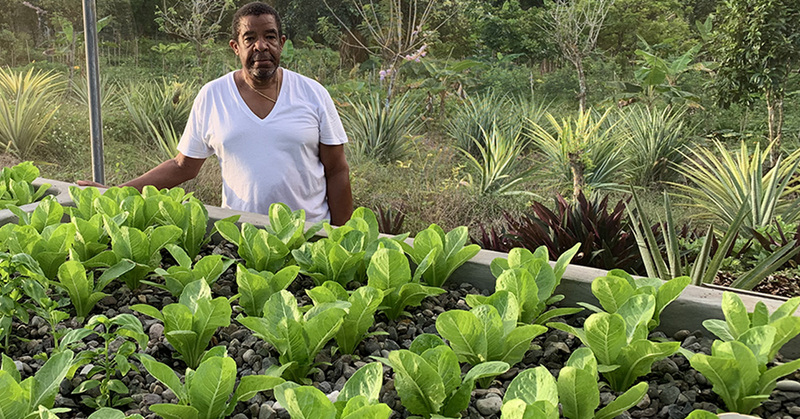 Meet Louis McLaren, one of our budding aquaponics farmers in Jamaica. A recent retiree, he enrolled in INMED Caribbean’s Increasing Access to Climate-Smart Agriculture (IACA) program to do something productive with his time. IACA provides technical and business training, access to loans, links to markets and ongoing technical assistance by INMED-trained agriculture extension agents to help emerging entrepreneurs launch aquaponics enterprises. “I was intrigued with the whole process of fish waste being used to provide nutrients for the plants and liked the idea of consuming organic healthy food,” he says. With INMED’s help, Louis has built a small-scale system consisting of two gravel grow beds and one 200-gallon fish tank enclosed in a 600 SF greenhouse that’s producing 65 lbs. of romaine lettuce every 40 days. ← Are you looking for a unique gift this Valentine’s Day?